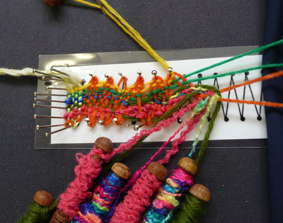 On April 17th 2013 Norfolk Lacemakers arranged their first lacemaking workshop, working with people that are either blind or partially sighted. We had a ratio of one tutor to two participants. 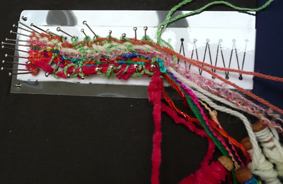 We used large pins and prickings with large bobbins together with vibrant coloured, textured threads. Everyone had a great time and we were most impressed with the progress. 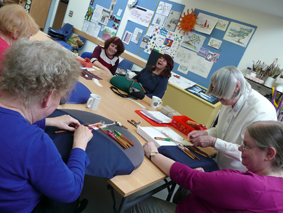 We held a further workshop on 17th July 2013 which also proved to be much enjoyed by all those taking part. NLM have been asked to hold more workshops in the near future, with the anticipation of an exhibition of work produced by the participants in 2014.